Born and raised in Adel, Senator Jake Chapman has always enjoyed living in a small community. The year he was born, his father started a private ambulance service based in Des Moines. From a very young age Senator Chapman was employed with the company. He has served as the director of business development, director of operations, and is currently the chief operating officer. Senator Chapman is also an EMT and enjoys working side-by-side with his colleagues. After graduating from Adel-DeSoto-Minburn High School in 2003 Senator Chapman served a mission for his church. For two years he worked with and served the people of Norway and was able to learn the Norwegian language. Upon returning from Norway he married his high school sweetheart, Jennifer Moore. They are the proud parents of five beautiful children: Isaac, Leah, Adam, Jared and Caleb. 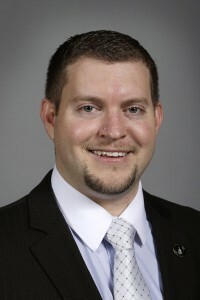 In 2008, Senator Chapman earned his associate degree with honors in business administration from AIB College of Business in Des Moines. In 2009 he graduated, again with honors, with his bachelor’s degree in business administration from AIB. He was on the dean’s list several semesters and is also recognized as a member of Phi Theta Kappa, an academic honor society. Senator Chapman proudly served as the president of the Young Republicans of Dallas County, which he helped establish in 2010. He has also served as member of the Dallas County Central Committee. Senator Chapman has been active in the campaigns of numerous Republicans at the federal, state and local levels. As the son and son in-law of veterans, public service has been a constant part of Senator Chapman’s life. From his efforts as a Boy Scout and recipient of the Eagle Scout Award to the positions in which he now serves, he has always enjoyed serving those around him. Senator Chapman is grateful for the opportunity to continue to serve the hard working people of Iowa at the state level.